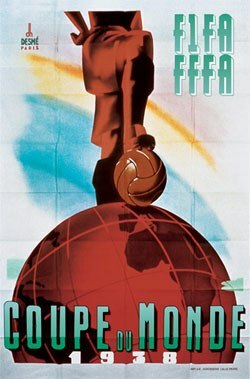 The third World Cup in football took place in France 4-19 June. The fact that two World Cups in a row were held in Europe was met with anger in South America that had expected the tournament to be played in their continent every second time. This led to a boycott from Argentina and Uruguay. In total 16 teams was participating after a qualification that included 37 teams (the host nation France and the reigning champions Italy was directly qualified). The World Cup in 1938 would be dominated by European nations, 13 of 16 teams was European. The most exotic team to participate was Dutch East Indies (Indonesia) that also became the first Asian team to participate in the World Cup. They had qualified since all other teams in Asia withdrew. Spain that was affected by a civil war were absent and the turbulent political climate in Europe that stood in the doorway to a great war would be noticeable. Most directly so since Austria just before the start of the tournament was annexed by the Nazi Germany and Austria was for that reason abolished. It was also noticeable in games that Germany or Italy was participated in by an upset audience. The Italian players made fascist salutes before the games and when they had to change to the away team shirt against France in the Quarter-finals, they would not play in white shirts as usual but black – the fascist color. The format for the competition was a knock-out tournament. If the match was a tie after regular match time a period of 30 minutes extra time would take place. If the match still wasn’t decided after extra time a rematch would be arranged the following day (penalty shoot-out was not introduced until 1978). 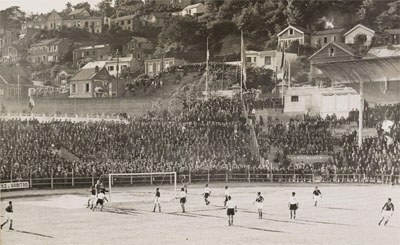 The match between Czechoslovakia and Netherlands in Le Havre. The matches would be played in ten French cities and on nine stadiums (see “Cities and stadiums” box for overview). However, since one match was canceled, no match was played in Lyon. This was the match between Austria and Sweden. The final would be played in Paris at Stade Olympique de Colombes that had a capacity of 60,000. On the sporting aspects, it could be stated that Brazil for the first time made a great impact in World Cup football and with a crowd-pleasing style reached far in the tournament. The biggest surprise was probably the Cuban victory against Romania. But tired after a replay match and playing on a muddy pitch Cuba wouldn't stand for another surprise in the quarterfinals, instead they got slaughtered by Sweden. FIFA World Cup 1938 would include 18 matches in which 84 goals were scored (4.66 per match). Four players were sent of during the tournament. First round, places 9-19: Norway, Belgium, Poland, Netherlands, Dutch East Indies, Germany, Austria, Romania. Quarter-finals, places 5-8: France, Czechoslovakia, Switzerland, Cuba. Italy and Hungary would win the Semi-finals and in the match of third place Brazil would beat Sweden with 4-2. The final was played between Italy and Hungary in front of 45 124 persons. The match was finally won by Italy after two goals by Gino Colaussi and Silvio Piola each. Hence, Italy would defend their World Champion title and become the first team with two World Cup titles. Because of the Second World War, the next World Cup had to wait until 1950.